VICTORIAVILLE, Que. 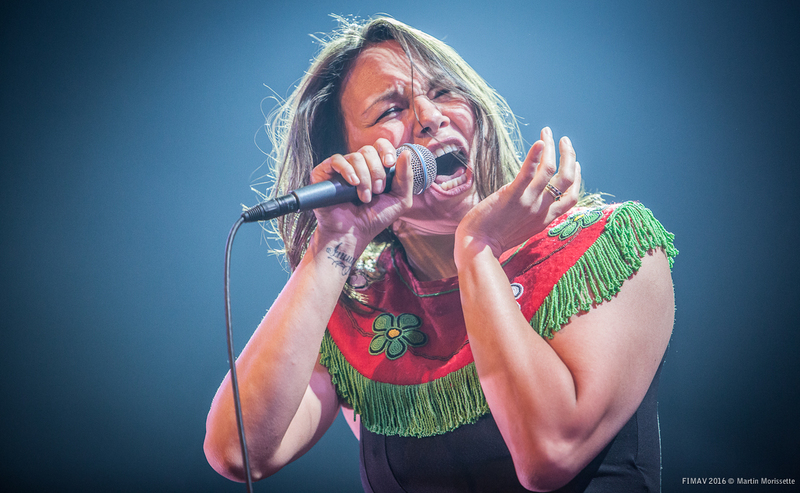 – Inuit throat singer Tanya Tagaq captured hearts and minds in the opening days of this year’s Festival International de Musique Actuelle. Her Friday night gig was a clear highlight among the first eight concerts at this festival of experimental and improvised music that began here Thursday, 100 miles northeast of Montreal. Backed by a 40-member choir and violin-drums-guitar band, Tagaq improvised a 75-minute set with a mix of guttural utterances, chants, and the game-like gestures that she learned from her mom in the Far North. Gesticulating as if in a trance, Tagaq meandered into an imaginary world, imitating the sounds of nature and depicting a universe that is not without its tragic side. Her vocalizing was punctuated by bursts from the choir, which enhanced Tagaq’s performance without overwhelming her. In response to rapturous applause, which seemed almost to embarrass her, Tagaq performed a short encore. The festival, in its 32nd season, has attracted fans and bands from across North America and Europe for its 25 indoor concerts and outdoor sound installations. Most of the shows are offered in the town’s hockey arena, with larger and smaller venues outfitted with top-flight lighting and sound systems, tables, chairs, and a bar. Five concerts are at the town’s new concert hall. The Montreal-based Bozzini String Quartet and Norwegian 12-string guitarist Kim Myhr opened Thursday with six minimalist and atonal compositions by American Christian Wolff. Its silences were integral to the moody 100-note pieces. The Norwegian percussionist Ingar Zach and Swedish-Canadian vocalist Erika Angell improvised deftly. They followed with a new piece by guitarist Myhr, featuring a five-note melody augmented by repeated guitar motifs and unison playing by the quartet. The overall effect was diminished by Angell’s recital of sophomoric-sounding poetry. Equally disappointing was the British ensemble of vocalist Julie Tippetts and Martin Archer (soprano sax, alto recorder, electronica), with Seth Bennett (bass), Laura Cole (piano, keys), Peter Fairclough (drums), and Anton Hunter (electric guitar). They played from their repertoire but much of it sounded like dated 1970s prog rock, the main exception being an improvised piece with multi-pitch vocals and spirited accompaniment. 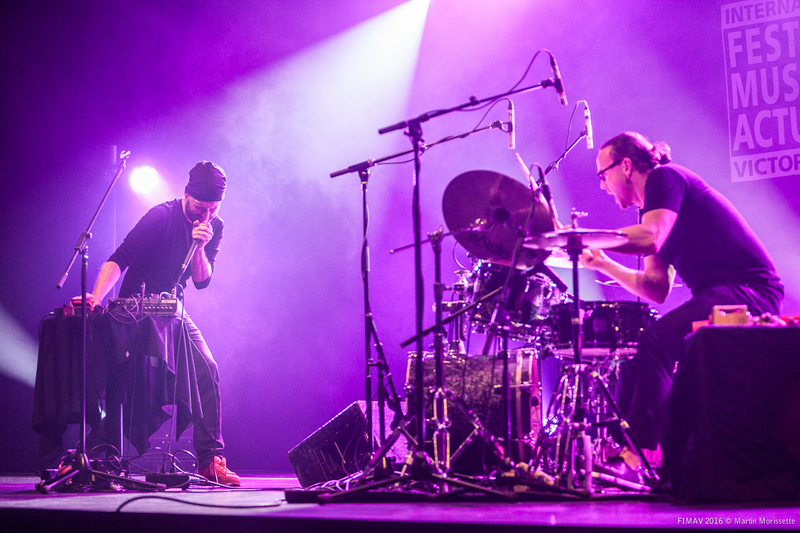 The best came last when Swiss drummer Lucas Niggli and vocalist Andreas Schaerer engaged in delightful avant call and response. Schaerer’s verbal gymnastics – grunts, growls, gurgles, whistles, chirps, clucks, and chants – blended nicely with Niggli’s imaginative and fun-filled percussive work. Much more sobering was the first gig on Friday – a most unusual trio consisting of three microtonal tubas played by Britain’s Robin Hayward and Norwegians Peder Simonsen and Martin Taxt. Their minimalist, lowest-register rumblings, however, did not offer many microtones: it was sedate and subdued, dominated by mesmerizing long tones. From tones, to drones – the next concert featured the electro-acoustic creations of French composer Bérangère Maximin. The soundscapes and varied textures from her laptap and table of electronic devices were varied, accessible, well structured, and entertaining. 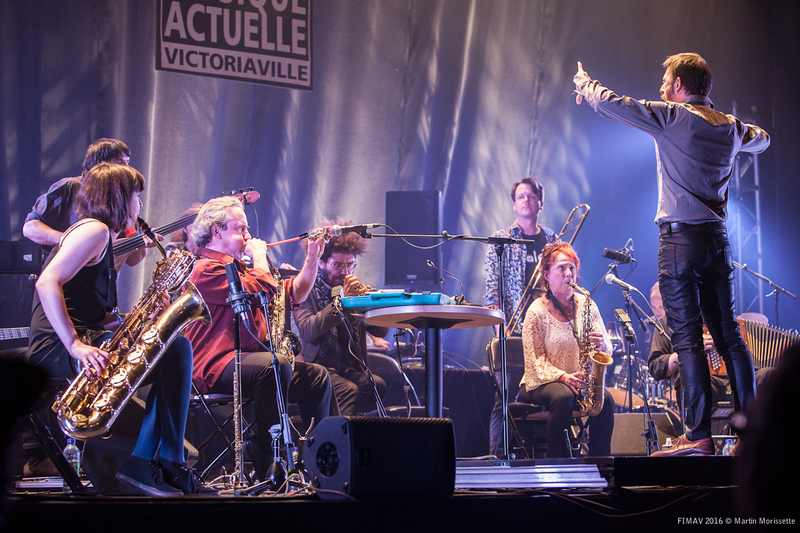 Another highlight was the meeting of two Quebec-based improvising septets – Montreal’s Ensemble Supermusique and the newer GGRIL group based in Rimouski, 335 miles northeast of Montreal. It was a directed by French conductor Olivier Benoit. From brushing sounds, long tones, scratches, pops, and bangs, the piece called Blue Salmon developed into a multi-faceted experience, with horn players, for example, using not only their instruments, but often just the mouthpieces to craft unusual sounds. The end product was orchestral in scope, at times intense and gripping. Wellman, drummer Olivier Fairfield, electric guitarist Pierre-Luc Clément and the loud-mouthed lead singer known as JFNO. His talking vocals are brashy and trashy, a mix of English and French words. He displayed flash cards saying, Oui, je te love and You like the smell – designed to provoke and challenge. They did.